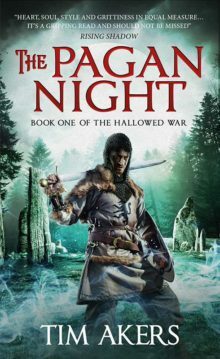 The Pagan Night is the first in an exciting and epic new series by talented world-bender Tim Akers. The island of Tenumbra is a land torn apart by its own gods, driven mad when the Celestial Church banished the old religion from the north and united the two nations of Tener and Suhdra under one holy banner. But pagans still haunt the nights, and the spirits of earth and air and fire that they once worshiped still roam the forests of the north. When a group of Tenerran rebels desecrate a holy doma, killing priests and summoning a hidden god, the countryside is thrown into civil war. It’s a battle that will reveal a secret hidden since the Crusades, unveil a corruption in the Church that will change the balance of power in the heavens, and test the trust between a father and his son. Malcolm Blakley is the Duke of Houndhallow, faithful servant of the Celestial Church and first among the Tenerran Lords. He gained fame in the Reaver War, when Tener and Suhdra put aside generations of mistrust and political strife to fight off an invasion of inhuman murderers. But time has passed, old prejudices and older grudges have settled back in place, and the two countries are ripe for war. The Celestial Church is losing its grip on the north, a situation made worse by the abuses of certain Suhdrin Lords and the Church’s unwillingness to discipline the noble Houses of the south. When war comes, Malcolm will do anything he can to keep the peace. Failing that, he will end the war quickly, at any cost, even if it means betraying his family to the Church he loves. His son, Ian, is of a different mind. Tired of putting up with the abuses of the south, and unsure of his own allegiances, Ian is determined to make his own path. He falls in among the pagan rebels and forges a new destiny, one that will put him at odds with his father, his faith, and his history. But sometimes truth is thicker than blood, and the dizzying power offered by the old gods is sharper than any sword. Gwendolyn Adair is the Huntress of House Adair, tasked with keeping the godsroads safe from the mad gods who roam the forests at night, working hand in hand with the Celestial Church and the Inquisition to protect the faithful from the pagan threat. But secretly, her family has been hiding a great heresy from the Church. At the end of the final Crusade, as the Inquisition was razing the old holy sites and banishing the gods of their people, Gwen’s ancestors secreted away one of the old gods. The House Adair has spent generations of misdirection and heresy keeping that hallow ground safe, but the High Inquisitor has caught their scent, and is on the hunt for the truth. The war that follows will test Gwen’s mettle, her courage, and her strength. And in the end, the decisions she makes may change the world forever, or end it. Enter a world of mad gods, inquisitor-priests, holy knights bound to hunt and kill the broken spirits of the world and the noble Houses caught in their midst, fighting their own battles of politics, prejudice and power. Face the darkness of winter, know the hope of spring, and keep the faith of the Winter Sun.